Pam Weeks knows a lot about quilts. She is not only a person who can create a quilt, but her descriptions of the time periods, the people and even the fabrics used in quilting create images of various time periods in history. When you listen to Pam speak about inscribed quilts, wedding quilts, and presentation quilts, for example, and the years the quilts were created, you are catapulted back in time. There you are, in your imagination, sitting beside a Civil War era wife as she stitches fabrics together by the light of a fireplace or kerosene lamp, or you might imagine yourself in the 1970s when a young person is making quilts at a time when arts and crafts saw a resurgence. Perhaps, as Pam describes a particular quilt or time period, you imagine yourself among a group of women who stitched a quilt together in a church hall or someone’s living room. With a college background in art education, Pam also loves the outdoors and was the first director of the Nordic ski program at Gunstock in Gilford. In the summer, she was the recreation director for Gunstock’s campground. Leading arts and crafts classes led Pam to do a quilting class. Pam laughs as she recalls that after doing further research, she discovered the quilt was made and signed by someone with the same name as her ancestor. Although it could have been a big disappointment, it got Pam even more interested in historic quilts and eventually led to her current job as the Binney Family Curator of the New England Quilt Museum in Lowell, Massachusetts. As well as her job at the museum, Pam is a lecturer on the roster of speakers with NH Humanities. She travels to locations all over the state and beyond, giving talks on quilt-making and quilt history. 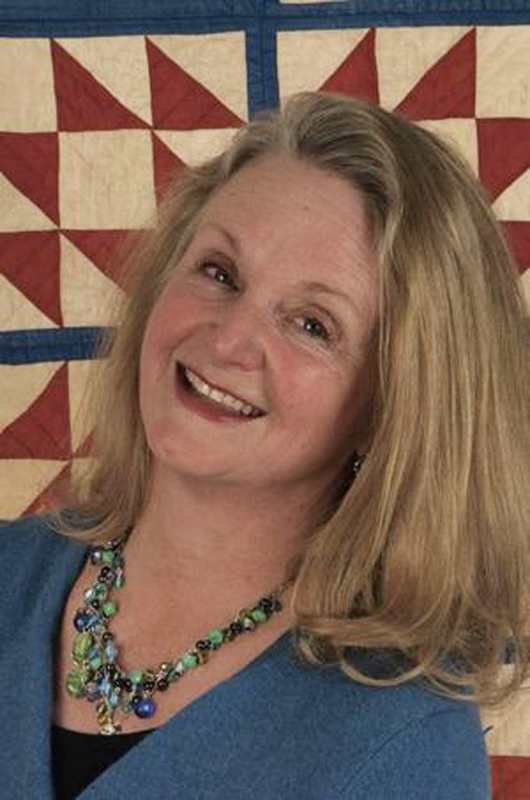 Pam uses quilts to tell stories of the Civil War, women's history, and industrial history and her audiences always leave a program with a lot of knowledge and a sense of the fun Pam brings to her programs. “Historically, lots of people made quilts,” she says. While quilting remained somewhat popular in other places, it died out in New Hampshire until the craft revival of the 1970s, the time period when Pam made her first quilt. In her lectures, Pam invites audience questions and also encourages people to bring in a quilt they own. She can tell a lot about the time period a quilt was made (which is a question often asked by those who attend a lecture), by looking at the fabric in a quilt and the colors. Pam adds that the Industrial Revolution started in England in the 1790s, making fabric much more available to the general public. The Revolution swept into America, and suddenly Americans also had greater access to fabrics. The quilts that were kept for use on a bed when an honored guest came to stay overnight are known as a show-off or show quilt. The quilt was placed on the top of the bed, and two to three blankets were under the quilt to keep the guest warm. Such a quilt also showcased the needlework skill of the maker. There is a picture many people have of quilting bees and sewing circles, where a group of women sat together working on a single quilt. All the women stitched the quilt pieces by hand, and the gathering was a social event as well as a practical project. While these events did take place, Pam says many women sewed quilts at home, on their own…on a sewing machine. One of the quilts Pam has learned of are remembrance or presentation quilts, which might be made by church members and given to a pastor when he was retiring or leaving the church. “These types of quilts celebrate a person’s civic or religious work,” Pam says. Pam has collected quilts from many areas and she has seen quilts in private collections. She says her collection is modest and she uses it specifically as examples of quilts made at various times, and in many colors and fabrics, for her lectures. A big part of Pam’s lectures show that an initial interest in dating or finding out more about a quilt can lead to new hobbies or interests. Perhaps, for example, you own a quilt made primarily in blue colors. You are curious about that blue, and when and why it was so popular. You research it and learn about the Industrial Revolution and manufacturing history. This might lead to further interests, proving that quilts are a gateway to finding out about our past and leading us to other interests. When Pam invites attendees to her lectures to bring in a quilt they own, she asks that they share whatever they may know about the quilt. Sometimes the owner knows very little or maybe only that it was made by an ancestor. With years of studying quilts, Pam is skilled at dating quilts by fabrics, colors and fads, as mentioned above. She will arrange quilts in chronological order and talk about how fabric was made and local mills that served as manufacturers of fabrics. Another lecture focuses on quilts made for use by soldiers during the Civil War. These quilts are very rare. Only 17 such quilts are known (so far) to exist, and Pam has studied most of them in person. In her lecture, she outlines the origins of the U.S. Sanitary Commission at the beginning of the Civil War; the roles women played on the home front, and on the battlefield and features the stories of 14 actual Civil War soldiers’ quilts. Over the years Pam has seen thousands of quilts, and some, she says, belong in museums. If you are the lucky owner of a quilt (especially an older quilt), there are some things you should know and do to protect your prized possession. First, inspect the quilt to see if it is structurally sound enough to be displayed. Obviously, if the quilt is coming apart or looks fragile, hanging or displaying it in any manner is not advisable. If you do hang a quilt that is in good condition, display it in a place without exposure to direct sunlight. “And don’t display the quilt for more than two or three months at a time,” Pam cautions. Storing should be done by wrapping the quilt in a sheet and placing on a shelf vs. putting in a box. “Quilt fabric needs to breathe,” Pam adds. For someone who loves quilts and history, having a job as curator at a special place such as the New England Quilt Museum is a dream-come-true. As part of her job, Pam says she travels a lot and is in contact with people who have quilt exhibit ideas. “I get to see a lot of good stuff,” she says with a laugh. Pam’s job is interesting, and because eight exhibits take place every year at the museum, she meets many quilting artists and continues to see collections, both private and public. “A lot of people collect quilts because they recognize their artistic value,” she says. Although she moves in the most respected of quilting communities, meeting all sorts of artists and experts, Pam remains down-to-earth and proud of her Lakes Region roots. Family is certainly important to her, and she speaks once more of the thing that got her interested in quilting so long ago. To learn more about Pam’s lectures via the NH Humanities, visit www.nhhumanities.org. To learn more about the New England Quilting Museum, visit www.nequiltmuseum.org. For information about Pam weeks, visit www.pamweeksquilts.com.